How To Get Your FREE Women’s Fitness Tank Top! Palm Beach Athletic Wear’s week long special savings event offers day long savings, free gifts, too good to be true deals and discounts on brandname fitness wear, just for you! If you are passionate about working out and looking your best in the latest fitness accessories and workout wear, you MUST visit Palm Beach Athletic Wear DAILY! 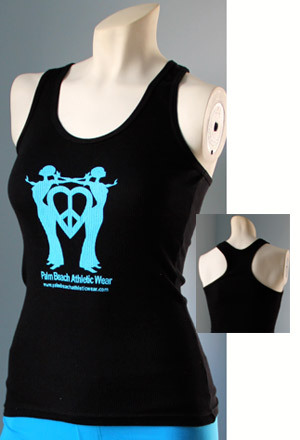 Friday, August 12, 2011 DEAL OF THE DAY: Get your FREE Women’s Fitness Tank Top -Our Peace HeartTank Top with every purchase of $100 or more! Add our Palm Beach AthleticWear, Peace Fitness Tank Top in your size (S, M or L) to your shopping cart, and use Coupon Code: TANK at checkout -It’s that simple!! This Exclusive Deal is for Today Only- Shop now! Our Week Long Special Event of Savings ENDS tonight at Midnight EST!